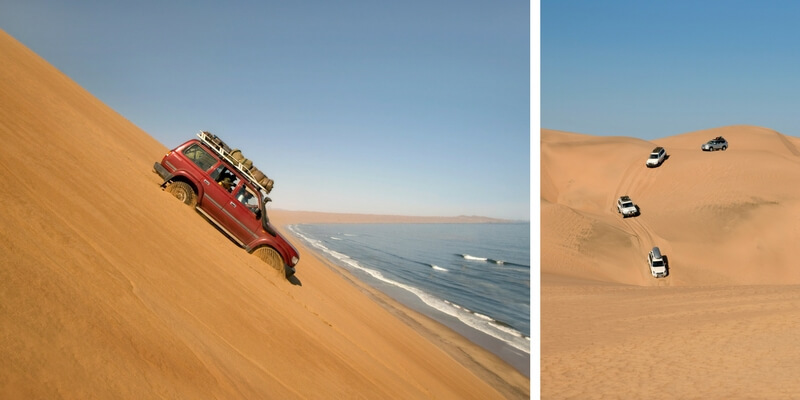 The Namib Naukluft is possibly the most serene and beautiful, yet inhospitable place on our planet; a 68000 square kilometre desert wilderness where a complete absence of fresh water means that nobody can live there at all. 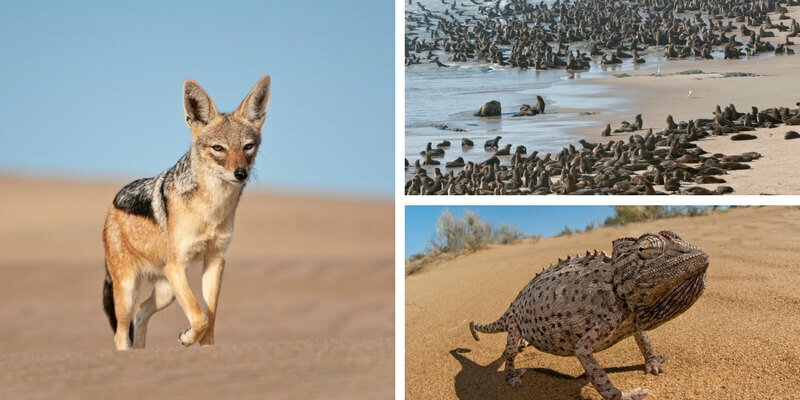 Animals are sparse but for a handful of characters such as oryx, springbok, chameleons and sidewinder snakes, but the wreckage of foolhardy folk who tried to conquer the desert is not rare at all. Evidence of these entrepreneurial mishaps can be found scattered here and there. I can attest to that, for during my five day 4×4 expedition across the world’s oldest desert, I encountered quite a few of these rusting hulks of historic junk. The first one we visited took the form of a dilapidated digger, literally in the middle of nowhere; a testament to the folly of freelance diamond prospectors. We then drove even deeper into the desert and found a worn-out truck which was sat forlornly in the middle of a dune street (a shallow valley situated between two parallel linear dunes). “She broke down in 1956” Volker, our guide, told us as we walked around her sand polished hull. An old fashioned metal wheelbarrow, half filled with sand, was laid on its side some distance from the truck and I wondered about the dreams and aspirations of those who had brought it here. No doubt, they imagined it brimming with glittering diamonds. But then the authorities of the time declared the entire region ‘OFF LIMITS’ to anyone who had not brought a very expensive diamond prospecting license from them. As a result, some mining operations went bankrupt, others went elsewhere, and some stayed and flourished on luck and perseverance. Those that didn’t became part of the scenery. This form of diamond extraction went on for decades until finally the well ran dry. The diamonds are mostly gone now, or at least the ones on or close to the surface, but the desert, despite being empty, is still an economic cash cow for the country of Namibia. Tourists, like myself, travel from South Africa, and indeed the rest of the world, to experience the beauty of the Naukluft National Park, and the money they spend on entry fees and the likes is helping to bolster the local economy. 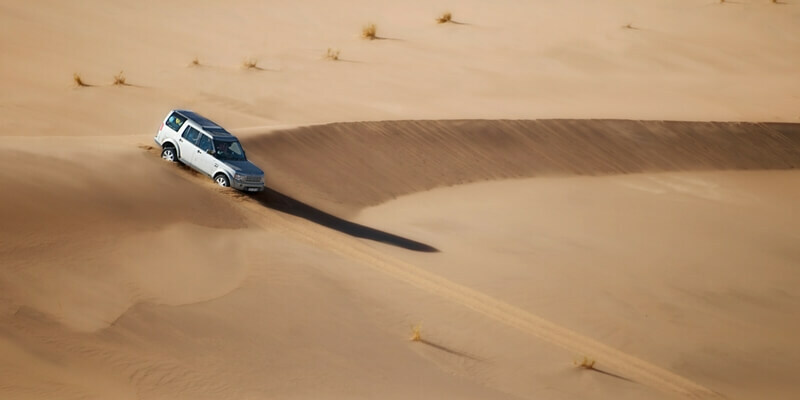 It may be that the real diamonds are gone, but there are now new diamonds in the desert; the environmentally conscientious tour companies such as the one Volker operates (Desert Magic) as well as the adventuresome clients he brings. When on the gravel plains, we drove only on existing tracks (many of which were laid down by prospectors decades ago) and then only in single file. Volker had earlier pointed out a distant oryx spoor on a hillside and then informed us that they could easily be over a hundred years old. Scars can last a very long time in the desert. “It is very important that we do not deface the special qualities of this dessert,” continued Volker, “but there are some people who can get a bit over zealous about these things, and it is they who have been lobbying to have these old wrecks removed. And I couldn’t have agreed more, and besides, these derelicts of dead men’s dreams are more often than not put to good use by the desert residents themselves. The digger had lizards living in it, and the truck’s front cabin was occupied by a crows nest. We bid farewell then to “Suzi” the truck and I wondered if the former owners could ever have anticipated that sixty years down the line; travellers, driving in ‘futuristic’ vehicles, would be coming through the desert to gawp at their misfortune. Anyone who has it in their head that a desert is an endlessly repeating swathe of monotonous dunes would be completely and utterly wrong. There is a diversity of scenery beyond imagination out there, and over the five days we spent in the desert, Volker took us through most of the representative habitat types. We commenced our journey by travelling across the golden fields and ghostly white plains on the Haiba flats and again on the last day as we skirted the barren Koichab Pan in the park’s south eastern corner. Here, either side of the dune sea, giant mounds of sandstone boulders cast shadows across great herds of springbok. In the interior; dunes of every shape and size stand like frozen waves on a stormy sea, and our vehicles became the ships we needed to sail across them. Islands of black rock, buffeted by hammock dunes, stood like sentinels above the shifting dunes. Ruby red garnet crystals dusted some of the dunes, as did jet black ilmenite, and to top it all off, the dunes themselves are all different colours. Close to the coast they are yellow or cream whilst further inland they are orange and red. The beach driving was, of course, superb; a gauntlet of corrosive waves, foam and cast off lobster shells; the Long Wall of Death (a giant coastal dune) towering on our left, the Atlantic rollers crashing fearsomely to our right. We had beautiful clear blue skies all along the way: apparently a rarity on the coast due to the usual presence of a thick and cloudy fog. He then went on to tell me a variety of stories of unfortunate souls who had done just that. Fortunately we didn’t hit anything angry. Throughout our journey we also visited a number of off world planets, the first of which was the Moon. It was nice being there but I was a little disappointed that, when I alighted from my vehicle, I didn’t bounce around in the manner of an astronaut. Apart from the normal gravity though, the likeness of certain parts of the mountainous areas of the Naukluft to images I have seen from the moon was uncanny. There are even jokes that this is where the Americans filmed their famous lunar landing. The most dramatic off world scenery came courtesy of the Urihauchab mountains which we reached on the 2nd night of the trip. The sun had already slipped away beyond the horizon when we reached there and the sky was pink, the rocks around us were red and orange and black, and there was not a single plant to be seen. And there, that night, we slept beneath a galaxy of stars, so bright and so crisp that it really was as if we were somewhere else, on some distant planet, far, far away from all of human kind. Right from the onset of our journey, we had learned to trust Volker in all things to do with navigating the desert. He forged ahead of us in the dune sections to lay down a semi compacted path and to make sure we all took a route that got us in, and then out the other side…preferably in one piece. We also relied on him to fill us in on all the fascinating facts on the region; historically, geologically and ecologically. And often times our convoy would be brought to a halt so that we could all get out to see a chameleon or a particularly interesting plant. Unnervingly we followed his spoor up seemingly impossible flanks, and we dove into holes that looked as if they could swallow us whole. We trusted him completely. We had no choice. Without him, our vehicles would have become permanent fixtures in the desert in no time at all. Lord only knows how groups of ego driven men make it through this place in one piece? Despite our general confidence in the fact that Volker was able to guide us calmly and safely through one of the most deadly environments on earth, there were, on one or two occasions, an obstacle to be tackled that left us wandering if he were not, perhaps, a little insane. One such obstacle was the ‘Bushman’s paradise entry dune’ another mighty mountain of sand, so steep that I got a dose of vertigo whilst standing on its edge. And so, like innocent ostrich chicks following their mad mother into a vlei full of jackals, we blithely went over the edge in single file; and there was much screaming and yelling and clamping of jaws. However, just like before when we had all careened down the Long Wall of Death, we all made it down to the bottom; albeit it with very pale faces and freshly ground teeth. That evening we camped in a gorgeous depression known as Bushman’s Paradise; a place of such astounding beauty that one cannot help but gasp in awe at its splendor. Curvaceous sand dunes towered over our tents as did mountains and precariously perched boulders. At night we were visited by cape foxes, their giant ears twitching in time to our murmured conversations round the camp fire. Sadly, as we all know, all good things must come to an end, and thus was the case with our magical trip through the great Namib Desert. We exited in single file, dust billowing from our wheels like NASA shuttles, and we paused on the outskirts to pump up our tires. Feral horses mingled there with Oryx and springbok. Giant ghostly mountains filled up the sky. And then some traffic went past us. A truck, a donkey cart, a bus full of people. It was shocking to see them after our time, completely alone, in the desert, and it wasn’t until then, until I could see electricity pylons and concrete and litter at the side of the road, that I realized how absolutely exclusive our trip to the desert had been. We had travelled through areas where there was not another single living human being for hundreds of kilometres, and we had seen places that few other people have ever had the privilege to see. But sadly, now we were back in the real world and I was already beginning to feel deflated. And he was right. I had no choice in the matter. And as I got back into my car for the long journey home, I already knew I didn’t need to say goodbye.